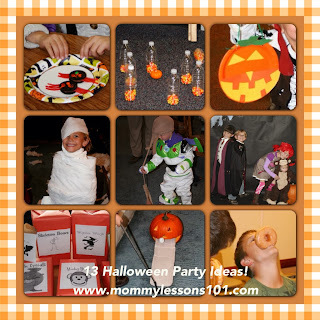 Mommy Lessons 101: Halloween Class Party Idea - MONSTER LAB! Halloween Class Party Idea - MONSTER LAB! If you're like me, class parties have been divided up and parents are trying to hurry and find a creative idea for the Halloween party. A few years ago, I was in charge of a station at a class Halloween party that involved food. I wanted something that had healthy and not so healthy, but also had a fun activity to go along with it. So I came up with the following idea and it was a HIT! At the end, I had a bag for each of them with the goodies for themselves to eat (that hadn't been touched by anyone!) and a little label to say what they were supposed to represent. Check out our 13 Spooky and Fun Halloween Games, Treats, Crafts and Activities!